Let's be upfront about this: We still don't have hard-nosed evidence for any life that's not of this Earth. That fact hasn't changed since the time of Aristotle. But unlike that gifted Greek, a lot of folks today think proof of alien biology could grace the next news cycle. After all, astronomers have recently uncovered thousands of new planets; space agencies have relentlessly hurled hardware at dozens of solar system targets; and SETI (Search for Extraterrestrial Intelligence) scientists continue to build new equipment for tuning in ET's radio chatter. Research budgets may be low, but expectations are high. Among the long list of locales where we might uncover life-as-we-don't-know-it, which are my favorites? In other words, where do I think we'll first find bits of self-organized chemistry that would forever – forever – be Exhibit A in our argument that life is a cosmic infection, rather than something extraordinarily rare or even unique? Listed below are my top six picks for your consideration and possible contention. Note two matters of importance: (1) All my picks are members of our solar system, not because I believe that the rest of the cosmos isn't rife with life, but only because I suspect we'll uncover biology first where we can search for it in situ. In other words, my choices are practical. (2) Don't expect to learn that any of these habitats is festooned with life that creeps, crawls or can engage in conversation. These are all tough environments for any creature bigger than a microbe. But this list is about quickly discovering biology, not finding brainy buddies. A major factor favoring this moon is that inhabitants could be easy to find. As my SETI Institute colleague Cynthia Phillips says, “Samples of whatever exists in those hidden aquifers are being continuously thrown into space, just waiting for us to grab.” No landers, no robot drills – proof for life on Enceladus may be there for the taking. 2) Titan: Enceladus' hefty sibling is the only world in the solar system (besides Earth, of course) known to sport liquid lakes. Mind you, these are lakes of ethane and methane – liquid natural gas – endlessly topped up by a drizzle of hydrocarbon rain. But despite the odd ingredients and Titan's gelid temperatures (minus 290 Fahrenheit, or minus 179 Celsius), this is a world where chemistry's a happening enterprise. In addition, we know how to get robot landers onto its surface, because we've done it. 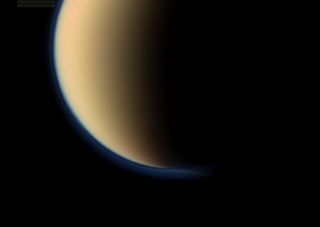 In 2005 the Huygens probe set down on Titan's ice-balled landscape. A future probe – able to sail this moon's pungent lakes – might uncover a cache of the Titans. 3) Mars: Never voted off the island, Mars remains perennially popular for those hunting for otherworldly protoplasm. Particularly intriguing are the dark stripes that appear in the Martian summertime at Horowitz crater. These are likely to be salty meltwater only inches beneath Mars' dusty epidermis. A relatively simple probe could sample this muddy environment. 4) Europa: Many would grant this Jovian moon a higher rating than I have, since there's probably more liquid water here than in all of Earth's oceans. The downside is that Europa's vast and salty seas lie beneath roughly 10 miles of ice that's harder than tensor calculus. Not only would it be a labor of Hercules to get a probe beneath this icy armor, but Europa's oceans are darker than a cave – which means photosynthesis won't work. However, there could be something down there subsisting on geothermal heat or complex molecules from the surface. 6) Callisto and Ganymede: I've binned these two moons of Jupiter together, as I feel they're neck-and-neck candidates for biology. Like their more celebrated neighbor Europa, they may have buried, liquid oceans. However, in the case of these two satellite siblings, briny deeps would underlie at least 60 miles (100 km) of rock. Finding inhabitants here is a shovel-ready project for our grandkids. These are my favorite places to look for extraterrestrial biology. I remind you that my preferences are no more than that: personal taste. The decision, as always in science, will be made by the data. If you wish to wager against me, alert your local bookie. Seth Shostak is a senior astronomer at the SETI Institute in Mountain View, Calif. Follow SPACE.com for the latest in space science and exploration news on Twitter @Spacedotcom and on Facebook.